Vulture is the name given to two groups of scavenging birds: New World Vultures and the Old World Vultures. New World Vultures are found in North and South America; Old World Vultures are found in Europe, Africa and Asia, meaning that between the two groups, vultures are found on every continent except Australia and Antarctica. A particular characteristic of many vultures is a bald head, devoid of normal feathers. This helps to keep the head clean when feeding, yuck. Whilst in the Pyrénées recently I encountered four species of vulture, but only managed to photography the Lammergeier (see last post) and the Griffon Vulture (see below). Like other vultures, the Griffon vulture it is a scavenger, feeding mostly from carcasses of dead animals which it finds by soaring over open areas, often moving in flocks. It establishes nesting colonies in cliffs that are undisturbed by humans while coverage of open areas and availability of dead animals within dozens of kilometers of these cliffs is high. It grunts and hisses at roosts or when feeding on carrion, something I encountered when visiting a private farm in the mountains, the hissing and grunting was unbelieveable, where there were some 100+ Griffon vultures fighting over a free meal. In Spain, there are tens of thousands of birds, from a low of a few thousand around 1980. The Pyrenees population has apparently been affected by an EC ruling that due to danger of BSE transmission, no carcasses must be left on the fields for the time being. This has critically lowered food availability, and consequently, carrying capacity. 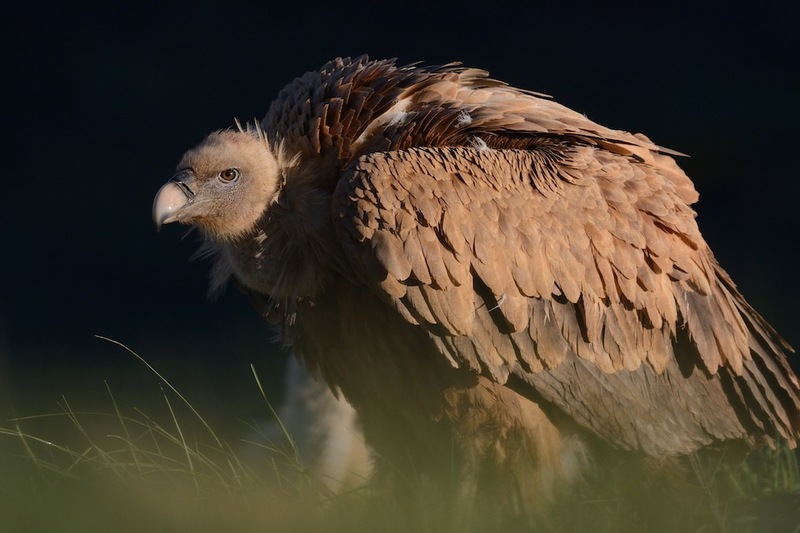 Although the Griffon Vulture does not normally attack larger living prey, there are reports of Spanish Griffon Vultures killing weak, young or unhealthy living animals as they do not find enough carrion to eat. 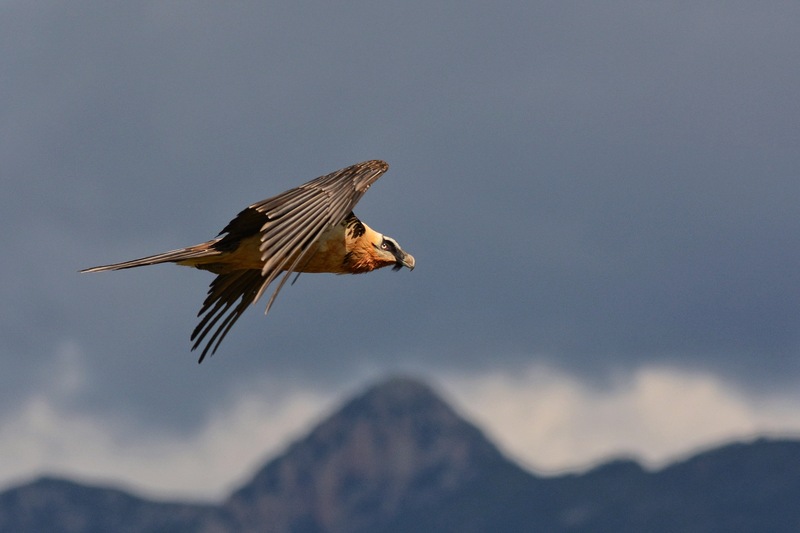 Last month (May 2013), a 52-year old woman who was hiking in the Pyrenees and had fallen off a cliff to her death was eaten by Griffon Vultures before rescue workers were able to recover her body, leaving only her clothes and a few of her bones. 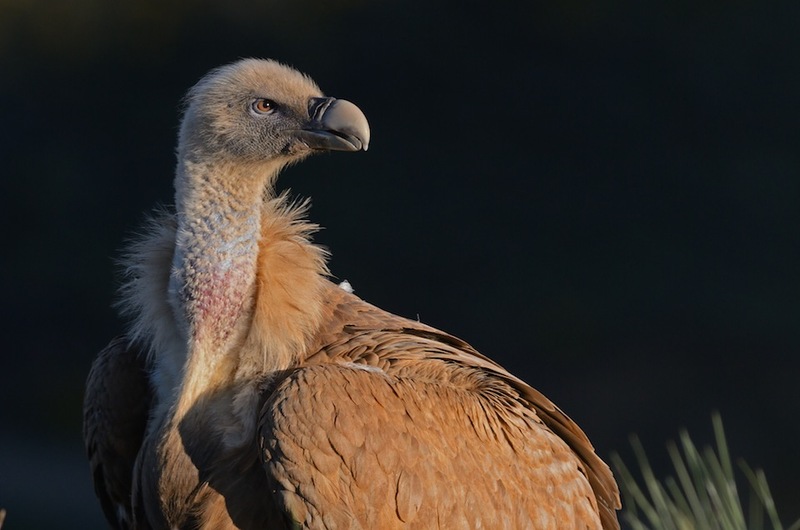 Due to her being the first human to be documented being eaten by Griffon Vultures, the story has brought worldwide attention to the Griffon Vulture. So the next time you hear of somebody climbing a mountain, or if you are lucky enough to go to the great plains of Africa and you see a “kettle” of vultures in the sky, then ask yourself who or what is the next victim of the dinner table! What lengths will some guys go to? In the bird world there are many “show offs”, birds of paradise come to mind, closer to home male black grouse and other game birds have their annual ritual to snare the hottest “chick”, no pun intended. So it is not surprising to also see in the latin world (Spain in this case), there is also a little macho action out there in the field. The Little Bustard (Tetrax tetrax) is a large member of the bustard family, breeding in southern Europe and in western and central Asia. Southernmost European birds are mainly resident, but other populations migrate further south in winter. The central European population once breeding in the grassland of Hungary went extinct several decades ago, unfortunately this has been the case for several other parts of Europe. 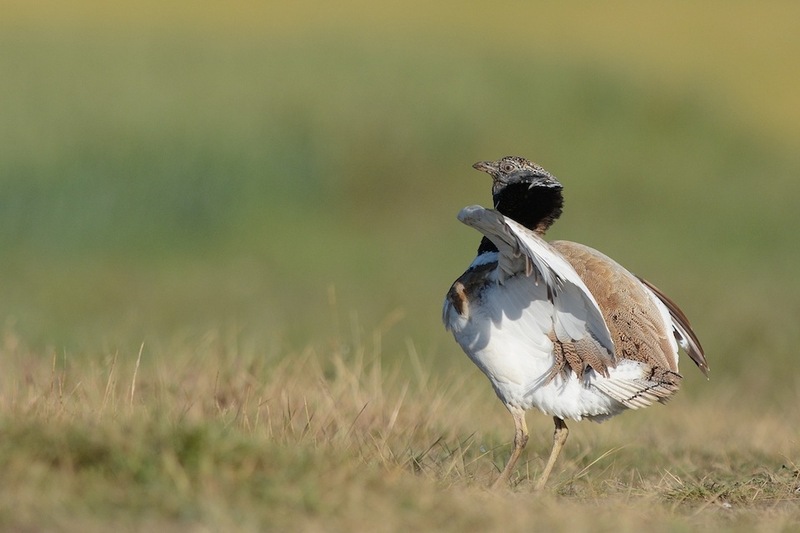 Like other bustards, the male Little Bustard has a flamboyant display with foot stamping and leaping in the air.